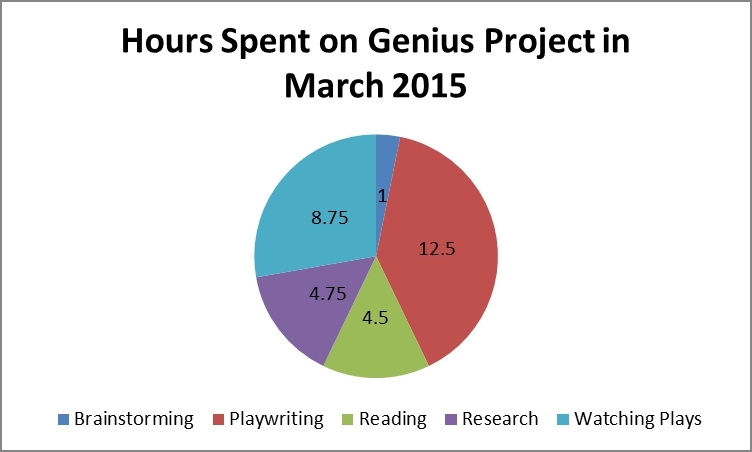 March started very well for the Genius Project. I was writing consistently every day and complementing the writing with research/reading or watching some plays. But it was short lived. March Break happened and we went for a brief visit to Montreal. I didn’t get any writing done during the visit. When we got back home and people were still off for the break, I found it very hard to get back to my routine and write regularly. Even when everyone was back to school, I felt like my routine was still off track. Initially, I was annoyed with myself. Why wasn’t I staying focused? Yes, it was distracting to have people home when it was usually quiet, but I should be able to overcome the distraction, shouldn’t I? Sometimes I write in my office downstairs and sometimes I write on the dining room table upstairs. While people were home, I was trying to work on the dining room table. Of course, it was distracting! I should have just gone downstairs and done my Genius Project commitment for the day and then gone back upstairs to hang out with the family. Having a place to write or do your art is important for many reasons. The most important thing about having a place to practice your art is that being there puts you in the state of mind to do what you have to do. It becomes your dojo or your gym. You are there for the purpose of doing your work. It helps cut away the distractions. Ideally, just being there helps put you into a creative state of mind. The important thing was that even though I ran into a bump in my writing productivity, I didn’t get upset with myself as much as I did in the previous months because I focused on the process. I decided not to beat myself up for not being “productive” and tried to find a better process to get me to do my work. Getting distracted and not writing wasn’t a “failure”, it was an opportunity to fine tune my process. In retrospect, it actually feels like a success. In the end, I still made my hourly quota. For the month of March, I spent 31.5 hours on the Genius Project. And I actually increased the amount of time spent on writing. Chart is below. My overall totals are now 685 hours. Only 9,315 hours to go! ← Are You Ready to Turn Pro?